After being mobilised in 1939 he completed operational training at Hawarden, Chester in 1940, Johnson joined No. 616 (County of Yorkshire) Squadron during its brief stay at Kenley in August/September 1940 just prior to its removal to Tangmere near Chichester. Although this was the height of the Battle of Britain Johnson saw little of the action. Aggravation of a previous broken collarbone caused trapped nerves and hospitalisation. During July, Johnson shot down two more Bf109’s, damaged two others and claimed a share in another. He was also on hand to support Bader’s claim of a ‘frightened’. This happened when Bader spotted a lone Bf109 and dived in to attack it. As he did so, the enemy pilot baled out before Bader was in a position to fire a shot at it! 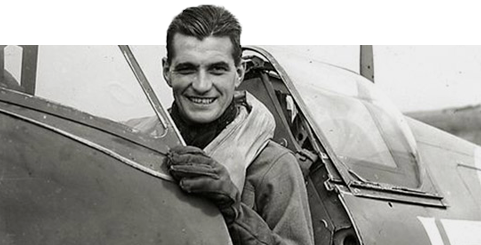 August the 9th 1941 was Bader’s fateful day, Johnson was one of the second pair to Bader’s as the Wing was detailed to cover a bombing attack in the Pas de Calais. Bader had, however, broken a golden rule by flying with faulty instrumentation and an intermittently unserviceable radio. Over the target area the Wing met with some vicious opposition, Bader’s aircraft was hit and no longer responded to its controls. Bader tried to bale out but his artificial leg had become jammed in the cockpit. The force of the wind eventually plucked Bader from his plane leaving the leg still entrapped. He parachuted to safety but stood no chance of evading capture. The loss of Bader after his five months with the Wing was a bitter blow to those he had led by spirit example and teaching. But, wasn’t it all the more remarkable that Bader’s wife, Thelma, provided the most comfort to ‘his men’ at a time when she should be distressed about the loss of the man she was utterly devoted to? They were to learn some days later that Bader was alive but a prisoner of war – eventual destination Colditz. After more claims of aircraft destroyed Johnson was awarded the Distinguished Flying Cross (DFC) in September as well as being promoted to flight lieutenant. Still, with 616 Squadron a bar to his DFC was awarded in April 1942. In July he was promoted to squadron leader to command No 610 (County of Chester) Squadron, this was based in 12 Group at Ludham in Norfolk. Much of 12 Group’s operations were to carry out the less frenetic work of covering North Sea shipping convoys. Johnson worked hard to get the Squadron back to the action in 11 Group but this did not happen until the Squadron was posted to the Tangmere Wing in January 1943. It had been a restful period in Norfolk but Johnson had been quietly honing his leadership skills and gaining experience as a leader. March 1943 saw Johnson promoted again, to Wing Commander, this time to lead the Kenley (Canadian) Wing. There becomes a strong link here between the career pattern of Johnson to that of Bader’s. The scenes from the film “Reach for the Sky” when Bader was confronted by a squadron of recalcitrant Canadians depict a quite real parallel. Whatever the attitude was of those Canadians who confronted Johnson on his arrival at Kenley he soon won their respect and moulded the entire Canadian population here into a formidable fighting force forging new standards of discipline as a result. His achievement, just as Bader’s in 1940, was the ability to get the best from the Canadians in the period to come. Thus for the second time in less that thirty years Canadians were to make an impact at Kenley. The Canadian Wing were flying the vastly superior Spitfire Mk IX with its two-stage supercharged Merlin 60 series engine. These aircraft had been rushed into service to counter the efficiency of the newer Fw190, it was a compromise aircraft because the Mk VIII Spitfire being built to house the series 60 engine was not yet in production, standard Mk VB airframes were, however, readily available. Operations with the Wing added to Johnson’s tally but this was not as important as the Canadians’ appreciation of his tough professional leadership that rose quite rapidly. As the Wing’s exceptional results mounted so did Johnson’s estimation of his fighting Canadians as their expertise grew. Just as Bader had developed his leadership skills Johnson set about bringing on the Canadians’ leadership within the various sections of the Wing. This was a distinctly different but very busy period for the Wing. In June Johnson was awarded the Distinguished Service Order (DSO) and had a bar added to it in September. Fighter Command then rested him to a staff appointment at 11 Group HQ. There is a clue to Johnson’s character that against the earnest advice of his Intelligence Officer he exercised his Wing Commander’s privilege by marking his Spitfire (EN398), JE-J his initials, he also used the callsign ‘Greycap Leader’ throughout, not changing it periodically as the intelligence officer had recommended. Johnson returned to active service in March 1944 to lead No 144 (Canadian) Wing and on its disbandment took command of the Kenley Wing which had been renamed No 127 (Canadian) Wing. Of course at this period the war was moving away from Kenley but Johnson maintained a successful career with the RAF retiring from it in March 1966 as Air Vice Marshal and having been awarded a CBE. Whilst being quite the highest scoring British fighter pilot and arguably of all the allied nations’ pilots, Johnson was remarkably lucky; hit by enemy gunfire only once during the many operations and sorties that he flew, his aircraft was never disabled nor was he injured. In the ‘argument’ over statistics it is pointed out that Johnson did not fly in the Battle of Britain and that much of his scoring took place when ‘our-side’ had greater air superiority. Surely this is ‘sour grapes’ – tactical ability, skill and teamwork provided safety and cover against being sent crashing to earth; certainly such characteristics cannot be termed luck.